The Bmw 5 series from 2004 despite of its bigger size than its predecessor it’s quite lighter and faster with a better fuel consumption and it doesn’t require too much car care activities because it’s a solid german auto and it does its job in a very good manner. Still, care of cars is lacking in today’s article with this funny highway car crash which involves a Bmw 5 series :D.
Even with the anti lock braking system, that black Bmw 5 series got over the highway rail, making it look like a funny highway car crash but still why should we laugh at the man if he wasn’t decided which turn to make, left or right :D. Well he decided to use none of those turns and went for a straight road, road which had an evil highway rail. When it comes to make a turn, choose one which doesn’t defy the laws of physics! I wonder how much did the car shop bill the man after the funny highway car crash. Still, as usual, this was a Bmw accomplishment done in style with the help of a man that was thinking about the Top gear lap so hopefully, he’s in the money for covering up the car damage made to his Bmw 5 series. Now that’s a great photo with that funny crash :). 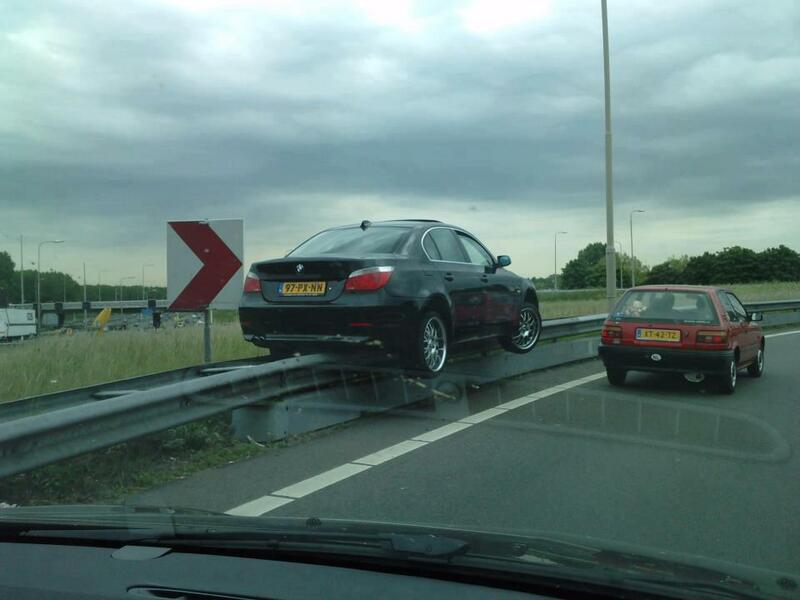 I own a Bmw 5 series too but i would never harm it like that!